Is it conceivable that two thousand years ago Jesus and members of His family came to ancient Caledonia, now Scotland. This extraordinary possibility is examined in detail by Scottish based author Barry Dunford, after having extensively researched this fascinating and intriguing scenario. There is reason to believe that the forbears of Jesus may have been of Celto-Hebraic origin and that while His immediate family came from Galilee, in Palestine, their earlier roots may have originated in the British Isles, specifically ancient Caledonia, now Scotland. Related to the foregoing is a possible link between the Jesus family lineage and the Celtic Royal household of ancient Britain, which is suggested in documents found in the English College of Arms (the Heralds Office) and elsewhere. This appears to have had a direct bearing on the presence of Joseph of Arimathea and a key Apostolic mission in ancient Britain. The ramifications behind this Christic movement in the British Isles are far reaching indeed. There have been a number of inferences from various ecclesiastical sources, together with many localised legends, encompassing the past two millennia, to the effect that during the first century A. D, an Apostolic mission in the British Isles, was at the root of the development of the Church of Christ in Britain. A British Apostolic connection appears to be further supported in the Declaration of Arbroath, signed by Scottish nobles at Arbroath, Scotland, in 1320. It was sent to Pope John XXII in Avignon, France, as a declaration of Scottish national freedom. Within this Declaration, as translated, from the original Latin, by Lord Cooper of Culross (1892-1955) we find the following interesting assertion: “Within this our realm there have reigned one hundred and thirteen Kings of our native royal dynasty, and not one of alien birth. If proof be needed of the quality and worth of our people, it shines forth for all to see in this that the King of Kings, our Lord Jesus Christ, after His Passion and Resurrection, chose us as almost the first to be called to His most holy faith, though we dwelt in the uttermost parts of the earth, and He would not that we should be confirmed therein by anyone except the first of His Apostles by calling, though the second or third in rank, Andrew the Meek, the brother of blessed Peter, whom He appointed to be our leader and patron Saint for ever.” This document which was based on ancient Scottish records, clearly reveals that St. Andrew was specifically charged with a mission to carry the message of Christ to Scotland by Jesus Himself. This presupposes that Jesus personally knew of the existence of ancient Caledonia and considered it of sufficient importance to send a leading Apostle there. What lay behind this? A dramatic stained glass window found in Innerwick Church, Glenlyon, Perthshire. It portrays St. Andrew against a Scottish Highlands background, wearing a tartan cloak. At the foot are two prominent croix pattés (Templar crosses). Does this reveal a secret Templar tradition of St. Andrew’s actual presence in Scotland and his possible Celtic background? There was also a tradition that during the reign of the Roman Emperor Domitian (81 A.D) some of the disciples of the apostle John visited Caledonia. It appears very likely that there was a strong Christian base established in Scotland by 200 A. D., as the ancient Scots Chronicles record that the then king, Donaldus, was the first Christian King of Scotland. Could such a situation have arisen from the existence of a secret Church of Christ based on an ancient gnostic Druid/Essene teaching and tradition, established nearly two thousand years ago in what is now central Scotland? And were members of the Jesus family involved in establishing such a spiritual centre? As a result of the author’s extensive research a remarkable story unfolds. Members of the Jesus’ family may have come to Scotland, to a place now known as Fortingall where is to be found a very ancient yew tree, which is believed to be the oldest tree in Europe. 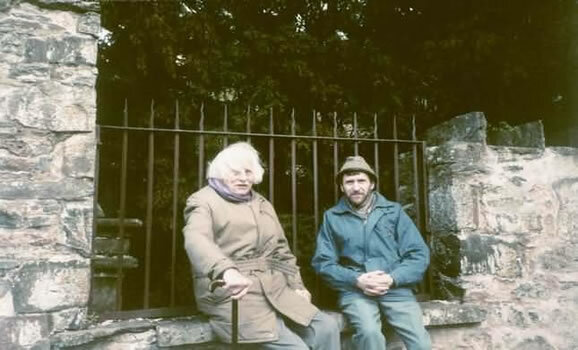 The author with Sir George Trevelyan at the Fortingall Yew in May 1994. Six months earlier, Sir George planted a sapling from this yew tree in Glastonbury Abbey, England. At the same time monks from the Tibetan Buddhist monastery, Samye Ling, Scotland, planted another sapling from this same yew, on Holy Island off the coast of Arran, Scotland. Aerial photographs of the village of Fortingall suggest that an early Christian monastic settlement may have been established here, possibly for the dissemination of an ancient mystery tradition centred around the Christ teaching. This could have formed the basis of a Johannine Grail Church which incorporated the mystery teaching of St. John the Evangelist. Apparently, as a result of a fusion between this possibly Essene based group and elements of a pre-existing Druid magi, this Johannine Church developed through a monastic line which became known in Celtic Britain as the Culdees. The author traces the extraordinary genealogical tapestry of the Christic Grail descent from the family of the antedeluvian patriarch Noah through to the immediate Jesus family circle. The Celto-Hebraic origins of the family of Christ are shown to be directly associated with Scotland, formerly ancient Caledonia, thus giving rise to its appellation as the Holy Land. Is this remarkable stained glass window portraying Jesus and Mary Magdalene holding hands? The woman appears to be pregnant which is highlighted by her girdle being painted around her lower abdomen rather than around her waist. 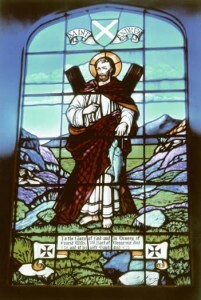 It has been claimed that a son of Jesus and Mary Magdalene was born on the holy Isle of Iona and, curiously, this stained glass window is to be found just eighteen miles away in Kilmore Church, Dervaig, on the Scottish Isle of Mull. In approaching the historical Gospel of the Grail, the author believes that a complete overview is not truthfully possible without giving some consideration and attention to the extensive ramifications of what can be seen to be a nefarious anti-Grail scenario. It is for this reason that he has covered in some detail the anti-Grail (anti-Christ) global agenda. 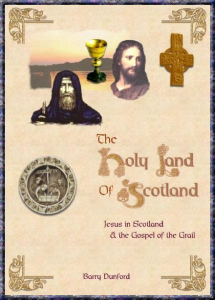 The Holy Land of Scotland contains a wealth of fascinating documented information and provides an extraordinary insight into the hidden history of humanity for the past two millennia and beyond. A truly ground breaking and comprehensive study which uncovers much hidden history. “It is a marvellous work and I hope thousands will read it. It does clarify much that one has found hinted at elsewhere but not so bravely expressed.” – Maryel Gardyne, Edinburgh, Scotland. “I look forward to studying The Holy Land of Scotland. I feel that you have uncovered one of the greatest truths that has either been lost, or more likely, covered up in the long lost past.” – Jim Naples, Bedfordshire, England. “I think that your book is very informative and inspiring and powerful.” – Rami Sajdi, Amman, Jordan. “I’ve just finished the book and wanted to say what a fascinating read your researches are. I particularly enjoyed the ‘Scots part’ and it seems to me your case is well made and I agree you are onto something here. As the whole thing is about ‘hidden history’ the middle and end parts were also interesting and raise many deep issues.” – Ian Ramsay, Ayrshire, Scotland. “Just finished The Holy Land of Scotland. Thank you for many important informations and deep insights. Thank you for incredible research!” – Christina Schkolziger, Switzerland. “Your book is an incredible wealth of information, the like of which I have never before seen.” – William McDougall, Reykjavic, Iceland. “Of all the books that I have this book is most dearest to me.” – William Smith, West Lothian, Scotland. “From the plethora of quoted material, I particularly liked this one from Kingsland (p. 268): ‘The life of the spirit that is lived – that is the only true religion.’ Absolutely. The question is – what does this really mean and how is it done? Perhaps the subject of your next book?” – Chris Garner, Edinburgh, Scotland.